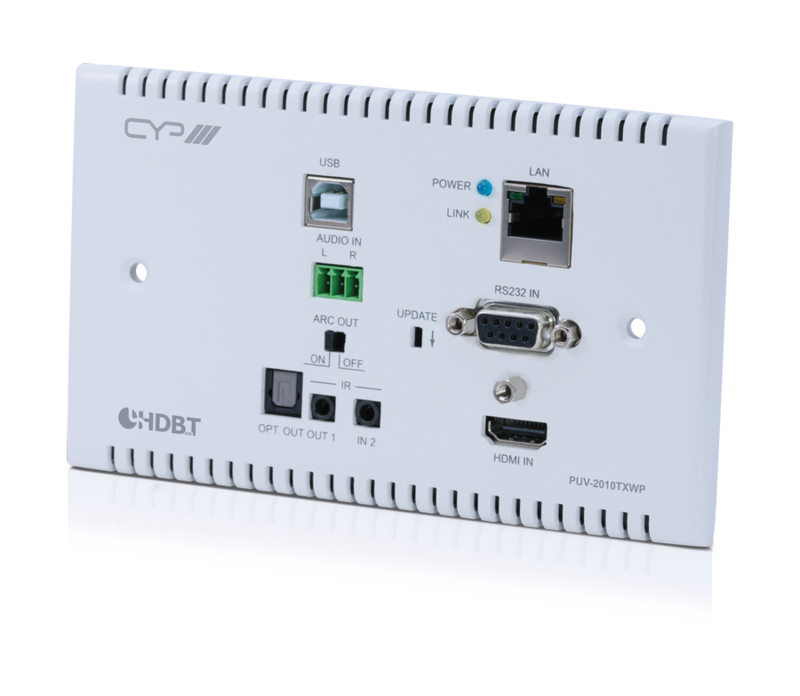 Med PUV-2010TXWP kommer nu CYPs nya serie av Wall Plate HDBaseT sändare och mottagare. Med fullt stöd för 4KUHD + 4K2K, HDBaseT 2.0, HDCP 2.2, OAR(Optical Audio Return), USB, LAN, PoH(Power over HDBaseT) och upp till 100 meter räckvidd med Cat6a/7 kablage så är dessa en utav de snyggaste och mest mångsidiga sändarna ur CYPs sortiment. 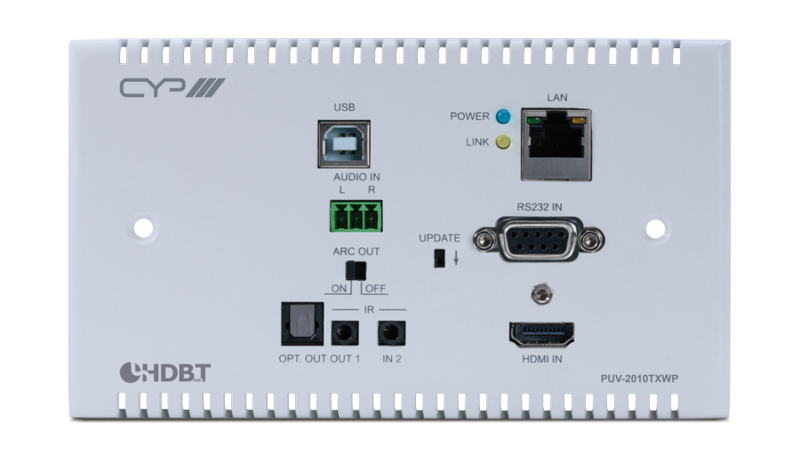 The PUV-2010TXWP Wall Plate Transmitter enables transmission of video resolutions up to 4K UHD, along with HD audio, 2-Way IR, RS-232, PoH (Power over HDBaseT), LAN, and USB data signals up to 100m. Utilising the latest HDBaseT™ 2.0 technology, this solution provides advanced signal management and dedicated audio pathways to ensure reliable results in the most demanding of installation environments. In addition to the full 5-Play convergence, this device also incorporates OAR (Optical Audio Return) and ARC (Audio Return Channel) functions which enable audio from a compatible display to be routed back from the receiver unit to the transmitter. All audio, video, control, and power are transmitted simultaneously over a single CAT6a/7 cable up to 100m. 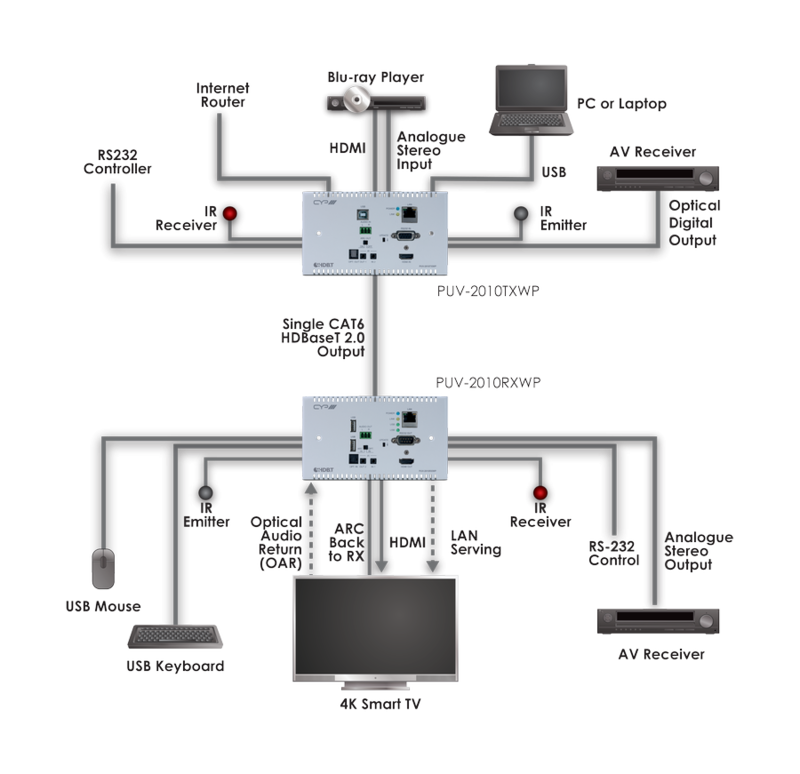 This system also allows the connection of any USB host, enabling a USB connection to 2 USB ports, giving the PU-2010RX Receiver the ability to act like a USB hub. 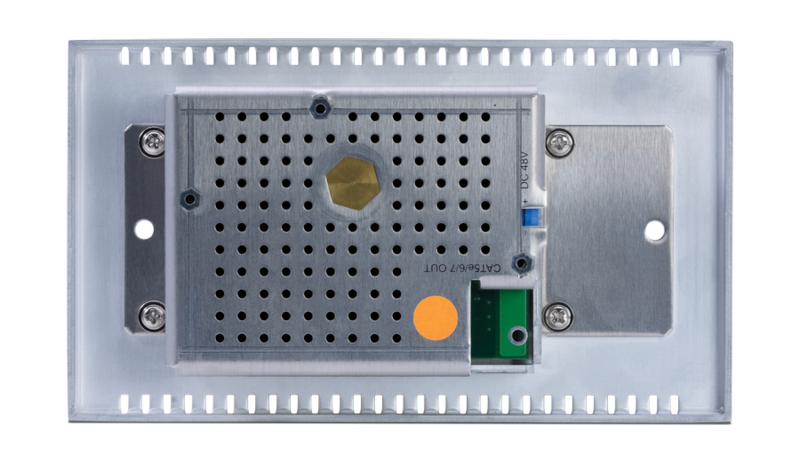 This wall plate variant of the PUV-2010TX transmitter enables seamless integration into a standard UK double-gang back box.